The one thing that struck me about the local government spending cuts this week apart from them being uneccessary, disastrous for the economy, disastrous for public sector workers and disastrous for the less well off, was that they are targetted at the north of England. The map from the Guardian shows the level of cuts to councils across the country and aside for the level of cuts in London, the cuts are aimed squarely at the north. It would be interesting to do some statistical analysis based on voting patterns, political control of councils, indicies of deprvation and so on, but I doubt it is necessary. The pattern of cuts shown visually is as clear as it needs to be. The cuts are going to protect the affluent Tory controlled south and take from poorer areas in the north. Pickles cuts are aimed at the poor - Tory policy in action. 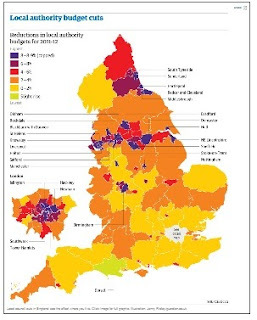 Good post, but beware that the map seems to show only the county council figures in two-tier areas. If it showed districts the inequality would be less distinct, though still clear.